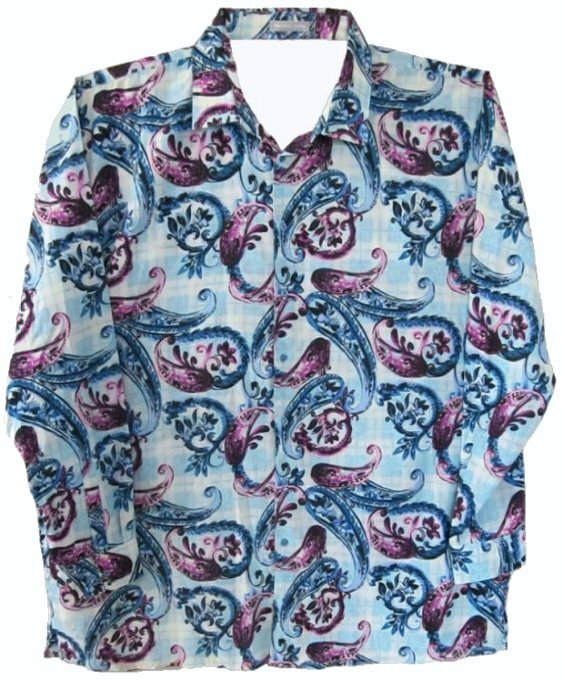 This never worn reproduction shirt is wonderfully loud, an absolute explosion of color. It is covered with Fuchsia, Lavender, Blue & Pink Paisleys. flat polyester that does not stretch. The collar is small. With such an explosion of color, does it matter? One can iron the collar to lay more open. Wear shirt with black, light blue, white or midnight navy blue colored pants. The shirt measures 50" around at armpit level for a loose 46 fit. The length is 31". The sleeve is 33".